On Wednesday the sun beat down on Scotland and as I finish work at 11:45am (on the dot) on Wednesdays Mr G, the Wee White Dug and the Teen were waiting outside the office to whisk me away for an afternoon of fun in the sun. We headed eastwards to our favourite half day stomping ground – East Lothian. The pretty East Lothian town of East Linton was our first port of call. The Crown & Kitchen is one of our favourite local haunts for lunch. They have a sun trap of a beer garden – perfect for sunny, summer afternoons. We settled outside and all opted for that lunch staple of soup and sandwiches. The soup, spicy tomato was lovely and had a real Bloody Mary like kick to it. The sandwiches, 2 clubs and a hot smoked fish of the day were all tasty too. The wee dug basked in the sun, scrambling to his feet every now and then to snap up the smoked salmon pieces which seemed to be mysteriously falling from his Dad’s sandwich. After lunch we were beach bound. We discovered Ravensheugh Sands by chance recently when visiting Tyninghame Beach nearby. It was one of those ‘how on Earth did we not know about this place?’ Moments. A HUGE stretch of golden sand and barely a soul around on a nice sunny day in East Lothian. This afternoon was no different, there were a handful of people there at most – perfect. We enjoyed a nice long walk and a paddle in the sea. The water was lovely and even verging on quite warm. Come in the water’s lovely! Mr G sat the sea paddle out. He has a real aversion to braving Scottish waters. Far too cold apparently. This is the man, who when I met him back in the winter of 2007 wore a thin jacket and no hat or gloves throughout the winter months. Apparently, being a hardy Highlander he didn’t feel the cold. I remember early in 2008 sitting through our first ever Six Nations rugby match at Murrayfield together. Me a Murrayfield veteran wrapped up like an Arctic explorer and him in his little French Connection jacket that you could shoot peas through, bare hands and no hat – Brrrrrrr. It seems the once hardy Highlander is now a Central Lowlands softie, far too delicate to dip his dainty size 10s in the cold sea. These days I usually have to wrestle him out of his hat and gloves come May. Hats, gloves, fleece lined neck buffs, down filled gilets, thick wooly socks – he has the lot. Anyway back to the beach. Towards the end of our walk and paddle a brisk wind whipped up out of nowhere, sandblasting our legs. The poor wee dug was at the optimum height to take it full pelt so we retreated back to the car his hair full of sand and our lower legs red raw. Our next stop was the stunning medieval ruin, Tantallon Castle. A red sandstone fortress which sits perched on a dramatic clifftop with unrivalled views across to that white beacon of bird poop the Bass Rock. Tantallon is one of my favourite Scottish Castles. A 14th century stronghold of the mighty Douglas Clan, it’s a fascinating ruin. The views from the battlements are both spectacular and hair raising. 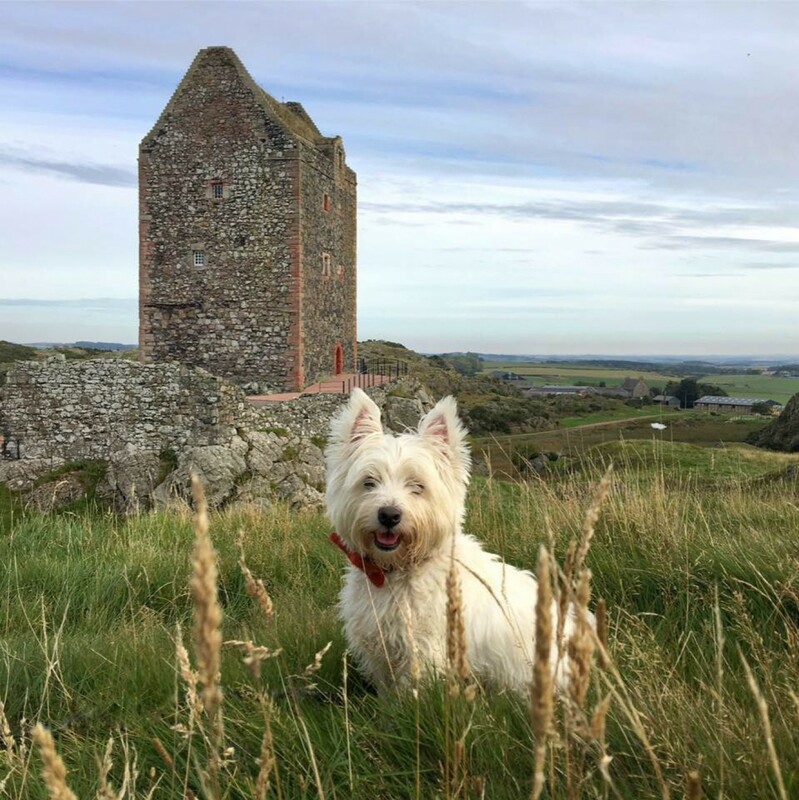 The wee dug loves a good castle ruin to sniff around so he was in his element charging up and down ancient stairs and into pit prisons. Unlike Ravensheugh the castle was a hive of activity with people wandering aimlessly into every photo. Luckily there was a sturdy, metal grate covering the deep castle well as I can’t say for sure that I wouldn’t have tipped a couple of the more persistent photo crashers into it. Dinner is served al fresco! After our castle explorations we decided to avoid any rush hour traffic back to Edinburgh and hang around in East Lothian for dinner too. On a lovely sunny day by the sea there was no contest when it came to what we’d be eating that evening. We headed to North Berwick for chips. Nothing beats fresh chips by the seaside on a nice summer’s day. The excellent North Berwick Diner and Fry was packed so clearly we weren’t the only people to have that brainwave on this gorgeous sunny day. We tucked into our chips, hungry from an afternoon spent out in the fresh sea air. Afterwards for pudding we had ice-cream from the award winning Alanda’s Gelateria. All of their ice-cream is made on the premises from scratch, using, where possible local ingredients. I set foot inside and instantly I was whisked off to Italy. I’ve long argued that you don’t find ice-cream at home as good as you do in Italy. I was wrong, completely and utterly wrong – it was wonderful. Just like in Italy they had the same huge array of mind boggling flavours to choose from. The teen took a modest chocolate cone but Mr G and I, mind’s blown by choice opted for 2 huge double scoops each. I finally settled on Bounty Bar and Ferrero Rocher. Heavenly and absolutely fit for the Ambassador’s reception. And that was our day. Another wonderful Wednesday spent enjoying simple pleasures and no rush hour traffic on the way home – yay. Previous Let’s celebrate with a tripe filled bone! Next Deep Time – Following in the footsteps of Bill & Ted! Ooooo we love a good walk and ice cream treat! Gorgeous photography! We’re jealous of the history you get to see up close over there! Thank you – we’re completely spoiled for history in Scotland. Just found your blog! We have had the pleasure of two wee white dugs in our lifetime. I miss not having one , trying to persuade my better half that we really do need another dog! Hope to get back to Scotland next year, love reading about your travels. So glad you like the blog. They’re wonderful wee dogs. I absolutely adore the boy. Good luck persuading the better half to get another one. They make such a difference to your life as you already know. What a great blog! Fantastic photos! I love the humor of Mr. G. Coming here from Texas, I really relate. Now I’m the one taking off layers in the winter while my Highlander husband puts them on. But no swimming in the sea for us here in Rosemarkie so far this year…that IS too cold…even for me! Thanks for another brilliant blog! As always, a lovely day presented in in your beautifully unique and personal writing style. Whenever I read your postings, I wish I was along for the adventures of the moment.